This was a huge winner at our dinner table last night. Inspired by the Chinese-Style Stir-Fry and and Asian-Style Fish Fillets in the Everyday Cookbook. With the simple flavours of garlic and ginger, this is a super tasty dish. What’s more, its a nice, easy recipe that requires about ten minutes in the kitchen and then sixteen minutes to cook. Who loves their Thermomix! Place oil into TM bowl and heat for 2 min/Varoma/Sp1. Add garlic and ginger and saute and chop for 2 min/Sp4. Transfer chicken and sauce to Varoma bowl. Place veges on Varoma tray. Don’t wash the bowl, add water to the TM bowl. Place rice into the basket and position in bowl. Place Varoma fill up to 1 ltr mark on the bowl with water and fit rice basket in place. Place Varoma into position the cook for 16 min/Varoma/Sp4. 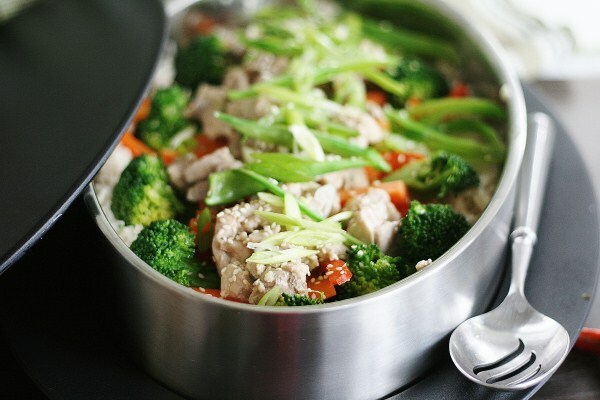 Remove rice and vegetables and check that chicken is cooked. Cook for another 1 -2 minutes if needed. I added some sliced snow peas into the vegetables in the last minute of cooking. Quantities can all be increased to feel a larger crowd.